Happy New Year from Falls Road Veterinary Hospital where we are dedicated to helping you give your pet a high quality of life! Our pets provide us with so much affection and unconditional love that we often consider them part of the family and may want to include them in our New Year’s resolutions. 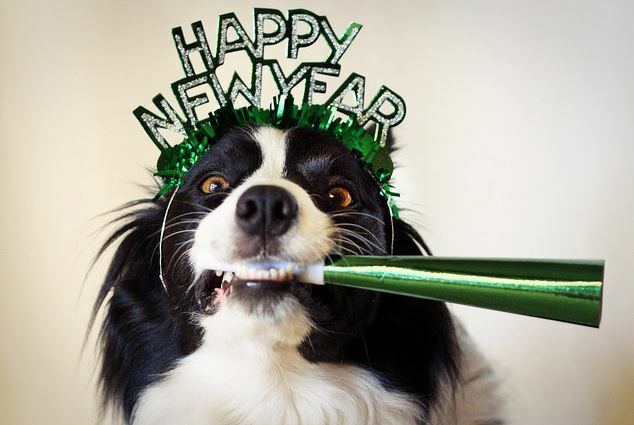 The following are some ways to include your pets in your resolutions. Keep pets up to date on important vaccinations and parasite prevention. It is much less expensive to prevent a disease than it is to treat it. Don’t procrastinate or miss veterinary exams and visits. If your pet is injured or ill, delaying veterinary attention could actually lead to higher expenses! Resolve to keep good communications with your veterinarian and veterinary staff. Keeping your veterinarian up to date on pet health and behavior changes could catch problems earlier, at more treatable stages. Consider investing in pet insurance or starting a pet health savings plan as the New Year begins. These simple steps can help you avoid financial issues if your pet is sick. Next on many resolution lists is the promise to exercise more and lose weight. Why not let your pet help you keep that promise? Like their humans, many pets in the US and Canada are overweight or obese. The New Year is a great time to make a commitment to losing those extra pounds. Studies show that dog owners spend about twice as much time walking each week than non-dog owners. This positive reinforcement can be beneficial for your goals and help your pet lose weight, too! Some people will make resolutions to spend more quality time with family. That resolution can be expanded to include the pets as well. There is an old adage that “a tired dog is a good dog.” Including a small amount of time in our daily routine for our pets can help prevent destructive behavior issues. In addition, the extra exercise and activity you provide for your pets might help with weight loss and prevent medical issues, thereby saving money on veterinary costs. Looking your best is another popular resolution each year…why not include your pets? Keeping a pet well groomed can help prevent skin issues and the associated expense of a groomer or veterinarian. Proper grooming and brushing is also another way to meet your resolution of spending more time with your pet. Helping others is a promise that many people will make each New Year. Keep that promise by volunteering your time at or providing needed resources for your local animal rescue or shelter. Finally, a great resolution for all pet owners is to promise to discuss all aspects of your pet’s care with your veterinarian before acting on information found online. Even though Internet searches and discussions with online friends might seem to be helpful, there is misinformation and bad advice present on the web. Avoid using “Dr. Google” as your only source of pet health recommendations. Your veterinarians are the true “pet health experts” and are happy to answer your concerns. Most importantly, your veterinarian’s advice will be custom fit for your pet! Happy New Year! Please feel free to contact us here at Falls Road Veterinary Hospital with any questions or concerns. (301) 983-8400. http://www.fallsroadvet.com. I recently took my dog to FRVH for the first time and was amazed at the cleanliness, staff hospitality & knowledge and the overall sense of caring & devotion I got from everyone there! I’ve been a dog owner for decades and have never experienced such a wonderful trip to the vet- EVER!! I cannot more highly recommend a vet for your pet than FRVH. The doctor was very well-versed in the complicated condition (according to three other vets I had tried first) my pet had, and the inexpensive and relatively easy treatment was a huge success. I am a devoted client (& my pet their devoted patient) for LIFE- thanks to all the wonderful staff at FRVH!! Thank you so much for the compliments! We try are best to serve our clients and their pets to make sure they stay as healthy and happy as possible. Happy New Year!